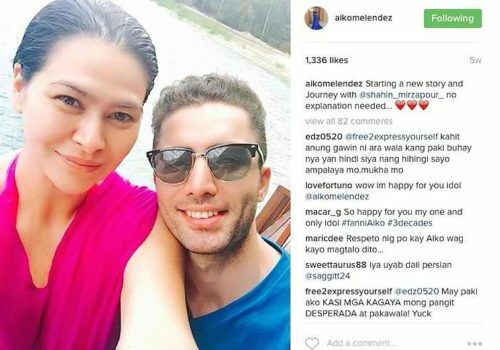 Veteran award-winning Kapamilya actress Aiko Melendez confirmed during an interview that she is having a misunderstanding with her eldest child, Andrei Ylanna because of her new boyfriend, the Iranian businessman Shahin Alimirzapour. The eldest son of Aiko felt hurt that his mom confirmed her relationship with the Iranian. During an exclusive interview with ABS-CBN’s top-rating morning talk show, “Magandang Buhay,” the 40-year-old veteran actress confirmed her misunderstanding with her son when the young boy knew through Instagram that she was officially in a romantic relationship with the Iranian businessman. The Filipino politician and actress also revealed that it took almost a week and a half for her to clear things out with Andrei, her son with former partner Jomari Ylanna. According to Melendez, one of the reasons why her son got angry with her is that he learned about his mother’s relationship on social media without talking with him first. Aiko Melendez was first married to fellow star Jomari Ylanna from 2000 to 2003 and they were gifted with a son named Andrei Ylanna. During the year 2006, she married Martin Jickain but their marriage was annuled in 2010. Aside from being a public servant in Quezon City, Melendez was also part of the TV series Apoy Sa Dagat last 2013 co-starring Angelica Panganiban, Piolo Pascual and Diether Ocampo. Melendez was also part of the 2015 movies Everyday I Love You and Etiquette for Mistresses.